Click on the chart to see more February jobs data. NEW YORK (CNNMoney) -- Hiring remained strong in February, fueling optimism about the recovery. Employers added 227,000 jobs in February, the Labor Department reported Friday. While that's a pinch slower than in January, hiring was still better than economists had expected. Three straight months of job growth over 200,000 is considered a strong sign for the recovery going forward. Economists called the report "encouraging," "robust," and even claimed the job market "has turned a corner." Good news also came from revisions to prior data, which show employers added 61,000 more jobs than the Labor Department had originally reported in January and December. The unemployment rate remained at 8.3%, as employers created just enough jobs to make up for new entrants to the labor force. Private businesses continue to be the main driver of job growth, adding 233,000 jobs in February. 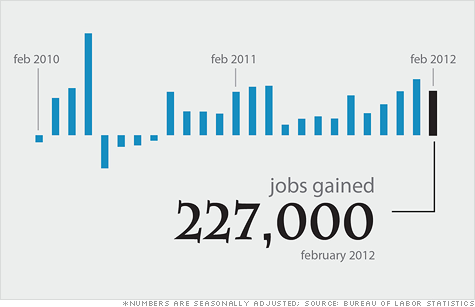 The private sector has added jobs every month since March 2010. In February, the strongest hiring came in professional and business services, which added 82,000 jobs. More than half of those positions were at temp agencies. "What that tells us is, the demand for workers has increased to a significant degree, but the employers who want the additional workers are not yet confident in the sustainability of the recovery," said Patrick O'Keefe, director of economic research at J.H. Cohn. Tig Gilliam, president of the North American unit of job placement firm Adecco, suspects many of those temp jobs will eventually turn into permanent full-time positions. Among his clients, much of the demand for temp workers is for professional positions in legal, accounting and health care -- a trend that he says typically occurs as a recovery strengthens. His clients are also starting to beef up their human resources departments with new recruiters, a sign that more hiring could be in the pipeline, he said. Meanwhile, the manufacturing sector also continued to be a strong job creator, adding 31,000 jobs. Restaurants and bars added 41,000 jobs -- an encouraging sign that employers may be expecting greater consumer spending in the future. The health care and social assistance sector created 61,000 new jobs. Government job cuts have been offsetting some of the private sector gains since mid 2010, but have recently started to slow. Last month, 6,000 jobs were lost in the public sector -- a far cry from the much steeper cuts above 20,000 just three months earlier. Despite all the improvement, the job market still has a long way to go to get back to pre-recession levels. The American economy lost 8.8 million jobs during the financial crisis, and has since added back 3.5 million jobs. About 12.8 million people remain unemployed, and 42.6% of them have been out of work for six months or more. In February, the so-called underemployment rate fell to 14.9%, its lowest level in three years. This figure includes people who are unemployed, as well as those who are working part-time because they can't find full time jobs, and those that have looked for a job sometime in the last year.